Little Girl Fell into a Panda Exhibit From Her Parent in China. Photos & Video - NAIRAFAME | Best Entertainment Platform. Acording to a chinese blogger, Parents should look after their children! A little girl who fell into a Panda Exhibit in Chengdu, southwest China's Sichuan Province, is quickly rescued by security staff before the panda bears get too close to her. A Little Girl Fell into a Panda Exhibit From Her Parent. Video According to a Chinese blogger, Parents should look after their children! 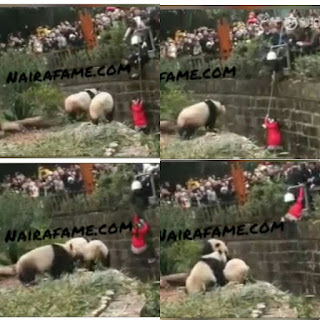 A little girl who fell into a Panda Exhibit in Chengdu, southwest China's Sichuan Province, is quickly rescued by security staff before the panda bears get too close to her.